“The King’s Speech” (2010, dir. Tom Hooper, photographed by Danny Cohen, BSC) opens with an image that is a visual metaphor for George’s central obstacle: intimidation and anxiety at his lack of speaking ability, represented by the microphone in this opening shot. The low angle combined with the heavy distortion of the shot (created by the use of a wide angle lens with a close subject), contorts the curves of the microphone, making it seem as if it’s leaning forward into the camera, giving it a domineering and imposing presence. The lens choice also accentuates the size of the microphone relative to the room. It visually fills the entire graphic space from ceiling to floor, making it an massive and pervasive presence that can’t be ignored or escaped. Adding to this, the shot is composed such that the perspective lines of the room converge on the microphone, demanding the full graphic attention of the frame. It’s worth noting that this shot is really a triumph of lens selection. The key elements that make this shot an effective storytelling device (the distortion and graphical arrangement of the microphone relative to the architecture) would have been impossible on a longer lens. You can also check out “Husbands” here. I decided to take a critical look at the cinematography of “Breaking Bad,” a show often lauded as one of the most “cinematic” on television. The analysis has been arduous, as before I could even begin to look at the cinematography of the show, I was compelled to evaluate what “cinematic” really means. This discovery process, as I will outline below, brought me to some conclusions about the differences in the approach to the photography of feature films and television. It seems that the core difference between feature film photography and television cinematography is that an episode of television is influenced by the photography of the episodes that have come before it. A single episode is just a small link in a vast photographic chain that could stretch out over the course of countless seasons. By contrast, in a feature film, the visual choices can progress wildly over the course of the film, as there is no prior episode that informs the photography, and no responsibility to return the following week with another installment. (Even in the case of sequels, regard for a consistent continuum of photographic choices seems to be frequently disregarded by directors who are eager to put their personal stamp on the franchise… take the “Harry Potter” and “Alien” franchises, for example). This leads to what I believe is the core difference between the cinematography in feature films and that of television: the single iconic image versus the memorable photographic concept. The iconic visuals from the films mentioned above are single moments. 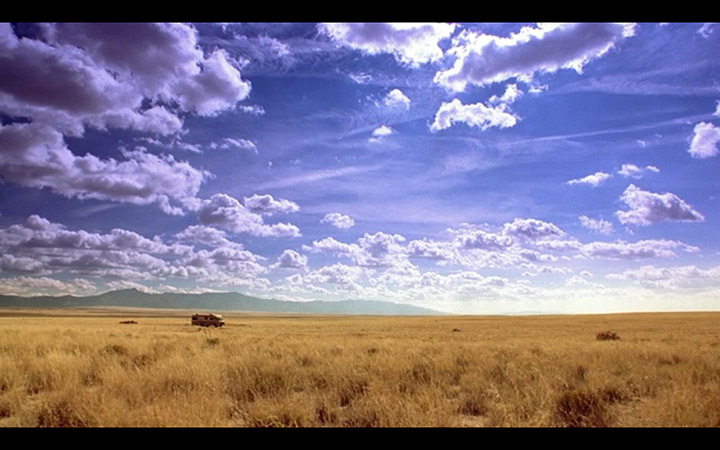 By contrast, the memorable images from “Breaking Bad” are photographic decisions that keep recurring. That seems to be the core essence of television photography: something that the audience experiences in a much greater volume over a greater period of time. In each episode, we return to familiar characters in familiar places. Even though the photography has to work to tell the specific story encapsulated in a single episode, it has to adhere to a previously established visual grammar to ground the episode. With this theory of the differences between feature and television cinematography stated, what exactly makes “Breaking Bad” “cinematic”? My personal conclusion is that the word “cinematic” has been inaccurately used to indicate simply that the show has much better and diverse visual storytelling than most shows. However, the cinematography of the show is a conventional television approach in the sense that it fits within the paradigm outlined above: overall photographic decisions which are consistent episode-to-episode, and hammer home consistent visual grammar week after week. However, what’s unconventional are the types of photographic decisions that are made (despite the fact that they are made consistently). 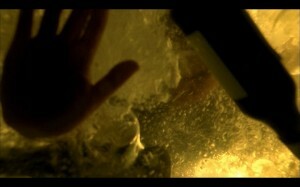 With that in mind, I discovered that analyzing television is incompatible with my method to approaching feature films. I can’t simply take a handful of key scenes and look at them in depth, because any individual scene doesn’t have an extreme density of visual meaning. It’s diffused throughout episodes and seasons through consistent choices. So, that’s what I decided to look at primarily: consistent photographic choices that create the framework for the visual storytelling of the show, rather than specific moments in specific scenes. 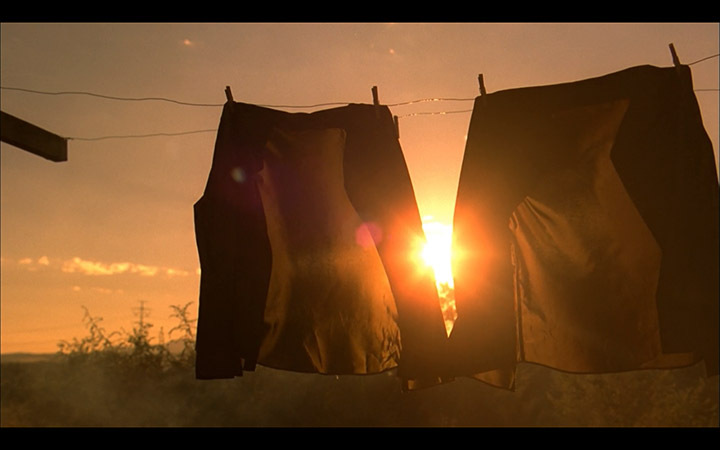 In ‘Breaking Bad’, harsh sunlight is used a metaphor for danger and the harsh brutalities of life, both literal and figurative. The light in the world of the story is callous and unmerciful. Every single character in the story is visually characterized on some level by their relationship with the light. The context of the first image is that a security guard has gone to investigate a residence. The audience doesn’t yet know what the scene is about until the pair of shirts hanging on the clothesline signals the audience the presence of The Cousins. The sunlight barely peaks out from between the two shirts, fighting its way to pierce the lens. We get the same sense from The Cousins: that they are a relentless force that will fight through seemingly impossible obstructions to achieve their vengeance. The second image is similar: the light barely peeks out from behind one of The Cousins, giving the sense of his brutal perseverance in the face of obstacles. 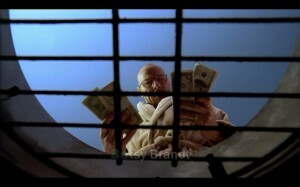 In the scene pictured above, Walt is attempting to convince Skyler that all the awful things he has done were for the family, and that they should take the money he’s made and move forward with their lives together. A bright slash of light penetrates the room and immerses Walt. The severity of the light singles out Walt like a spotlight, seemingly magnetized to him. It visualizes the sense that he is singularly guilty of bringing this conflict into their household. In this sense, the light is being used as a visual metaphor for strife. In the case of The Cousins, it was literal, physical danger, in this case it’s marital conflict. However, this sets the foundation for how the presence of hard slashes or hits of light are used in the show as one of the primary visual storytelling devices. I’ve been making the case for light being a metaphor for danger: from the flares that characterize the violence of the Cousins to the slashes of light that penetrate the White household with the promise of broken relationships and mortal threats. However, the absence of this austere lighting is equally important in the show. 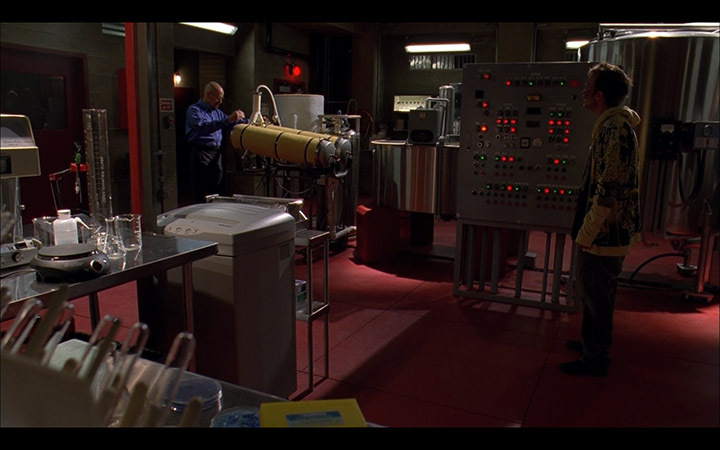 The laboratory, sold to Walter on the promise of being a safe and secure way to cook, is characterized by the lack of the hard slashes of light that signal danger. The light, although low-key, lacks the previously described violent connotations and therefore works to characterize the lab as a secure and unvarying place. Ultimately, though, Walt rejects Gus and the subordination that comes from from working for someone else. This hints at the core of Walt’s character: whereas the old Walter White craved the harmonious consistency of the lab, Heisenberg won’t stand for it. 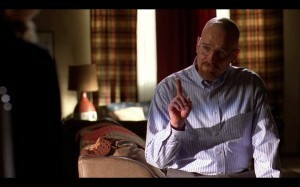 Heisenberg craves ultimate control over his own life, which invariably comes with risk and danger. Another interesting example of this can be found in Saul’s office. Saul has made a career off profiting from criminals like Walt and Jesse, while managing to avoid the type of danger that Walt seems to attract. 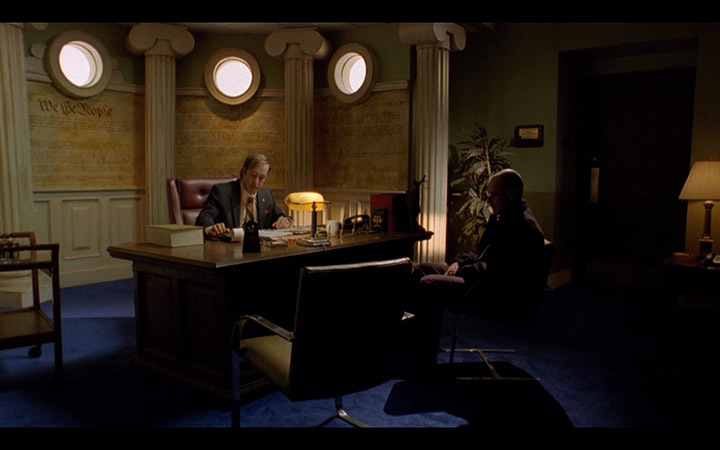 The lighting in his office is a perfect characterization of this. The high windows and lack of the show’s characteristic light slashes create the sense that it’s a space that the light tries to penetrate, but can’t. 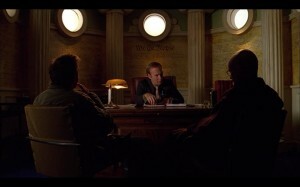 It portrays Saul’s office as a small den of safety, and serves to characterize Saul as someone who has an aversion to danger, and has a real ability to protect Walt and Jesse. 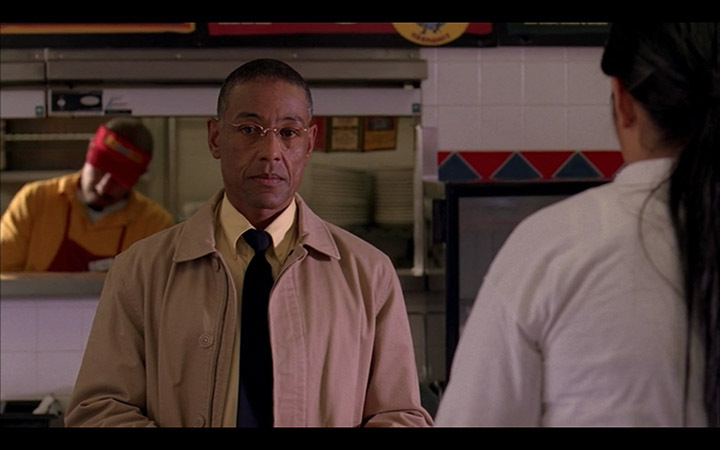 Finally, at the far end of the spectrum of lighting in the show is the Pollos Hermanos restaurant, the realm of Gus, the powerful drug kingpin with the invariably modest lifestyle. The flat lighting of the restaurant runs counter to the threatening slashes of light seen in the White household. Within the context of danger established by the aforementioned hard hits of light and flares, Gus’ restaurant (and by extension, Gus) is the safest environment in the show. In that sense, the lighting is ironic in that one of the most dangerous characters in the show is featured in an environment coded as ‘safe’ by the shows visual grammar. 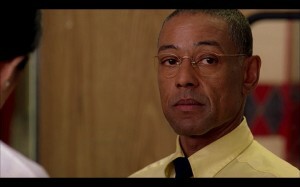 However, this serves as deep characterization: despite being incalculably criminal, Gus feels safe in plain sight. 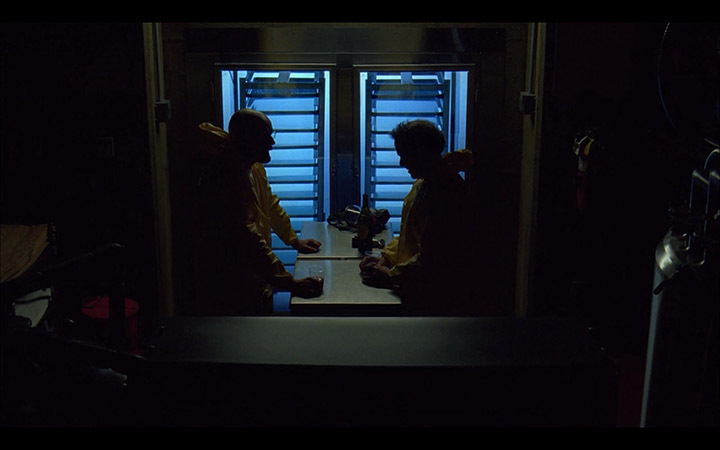 Unlike Saul, who retreats to his cavernous office where the light can’t penetrate, or Walt who has the safety of the similarly lit lab, Gus exists in this flatly lit void where danger seems to not even be a consideration. 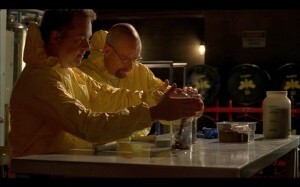 Next time I will be investigating the compositional choices of “Breaking Bad.” If you enjoyed this article or want to add to the commentary, please leave a comment and/or Tweet / FB / Digg it! 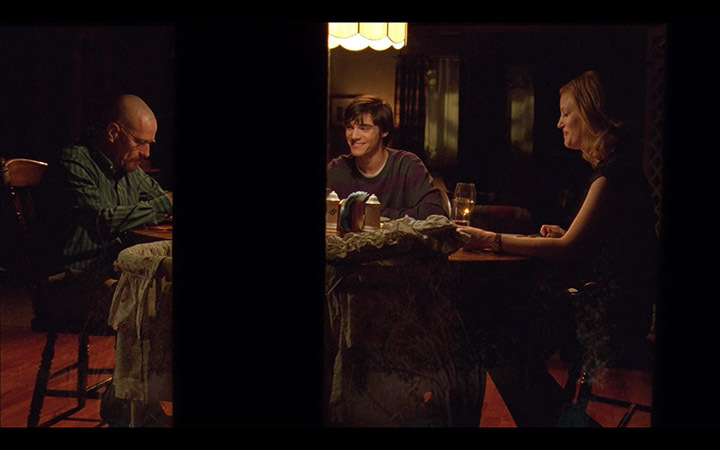 One of the most striking images in this scene is the vertically stretched face of Pinbacker. 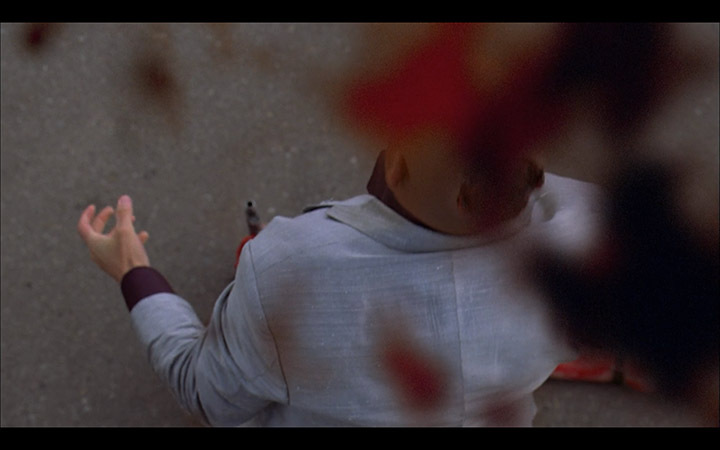 Visual distortion is a motif that begins here and carries through to the end of the film. The single most important image in the film is that of the sun: a perfect, symmetrical sphere. The deformed face, by contrast, gives a sense of the imperfection and corruption of the character. Even in this early scene, not knowing yet what happened to the Icarus I, the audience gets the sense that there is something tainted about his character. 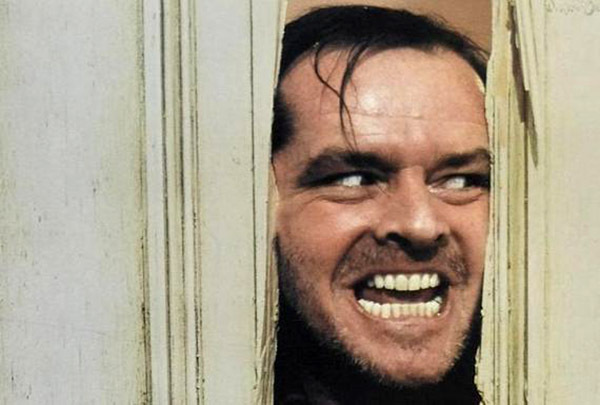 The contortion of a human face would carry weight in any film, but it has added meaning in this one because of the established motif of circular perfection. An added layer to this is the pixelated distortion of Pinbacker’s eyes. Again, disfigured eyes could give a sense of imperfection or corruption independent of context, but in this film, there is a greater context constructed because of a previously established eye motif. Earlier scenes (see above) featured shots of eyes reflecting sharp sunlight. Pinbacker’s eyes, by contrast, are dull and dark, giving the sense that despite his claims throughout the film to have born witness to divine power, he in fact experiences nothing. At the end of the scene, a pan and rack focus from Pinbackers eyes to the Captains own darkened gaze draws a connection between them, and gives the sense that the Captain fears that he may end up corrupted like Pinbacker. 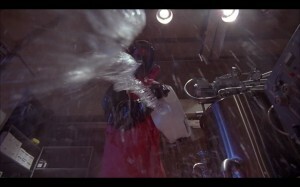 The face of Pinbacker is always made hard to view, either by a double-image distortion technique, by putting him in silhouette, or by compositional choices that cut off most or all of his head. 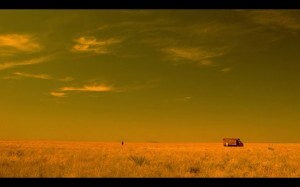 This defines Pinbacker by contrasting him to the films core visuals. 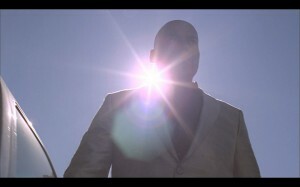 Whereas the sun provides an overabundance of information and power (so much that the crew can’t even experience its full power without killing themselves), the photography of Pinbacker expresses the antithesis of this idea: through the various techniques outlined above, he is sparse on information, and something that the crew (and audience) can’t clearly behold. Like the previous scene, the net result of these contrasts is to portray Pinbacker as something corrupt and unable to truly connect with divinity. 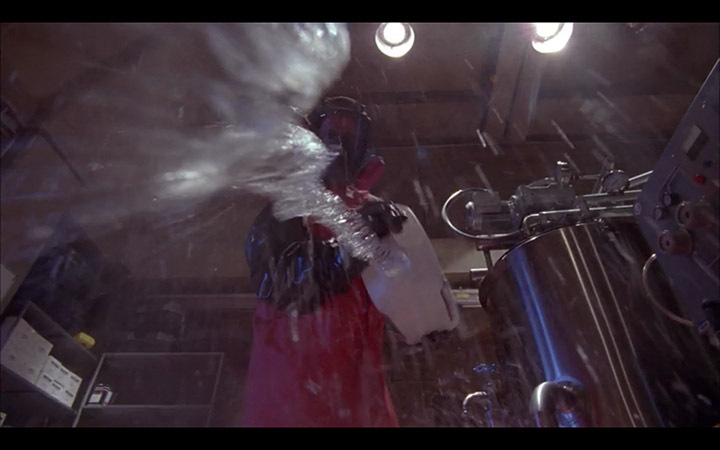 An extreme wide shot of Pinbacker in a stable, symmetric composition (in contrast to all of the previous, violent and unstable compositions of him), removes him as a menace. Similarly, a massively distorted upside-down shot of Capa revolves around 180 degrees to land on a completely undistorted close-up of his face, reinforcing the sense that the threat of becoming like Pinbacker is resolved. Divine Witness III from Cinevenger on Vimeo. In portraying Capa touching divinity, the film employs almost every single visual motif that it’s been hammering in since frame one. It’s unnecessary to re-hash an analysis of each of the elements, but one thing easy to overlook is the significance of the composition above: it’s the only truly centerpunched and symmetrical composition in the film that’s not a shot of the sun. In that way, the film conserves the visual power established by the images of the sun and saves it until the end for maximum impact. There hasn’t been massive amounts written about the cinematography of this film, but I would suggest this American Cinematographer article. Also, this article, while not specifically about cinematography, places the film within its historical science fiction context.